Imagine a patient who has a complex condition and who needs to be treated with a combination of drugs. His treating physician is familiar with all the drugs prescribed but is unsure of the possible interactions between them. So, he calls the pharmacovigilance service to get advice. Louis is the one who answers these calls. Louis teamed up with 5 other medical interns who are challenged by problems in their everyday practice and were motivated to bring innovative solutions to pitch a drug interaction app. 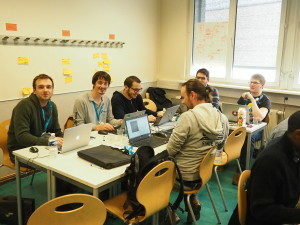 The “best solution targeting clinical physicians” was born at Hacking Health Camp in Strasbourg, in March 2015, with the app DrugSquare. The app answers physicians’ questions on the known risks and interactions of drug combinations and processes. It presents the information in a clear, transparent way, approved by competent authorities. “HH Camp was a turning point for the team”, explains Clément, one of AquitHealth leaders, “we experienced an intense weekend where our professional complementarity and transversal approach to medecine galvanized our project and gave us the conviction we were responding to concrete needs”. Their first apps DrugSquare and BBSanté benefit from the experience and know-how of the 6 AquitHealth leaders: Louis, expert in public health and pharmacovigilance; Edouard, focused on epidemiology research; Sébastien and Clément with medical IT experience; Thomas, who is studying health economics and the impact of new technologies in the health system; and Pierre-Antoine, who works on obtaining approval from regional authorities. AquitHealth has been accompanied by UNITEC and AECOM to structure their business model, answer intellectual property and other legal questions. Their mission is to create “Safe apps by doctors”, with the support of institutions such as Bordeaux University Hospital and Health TIC Cluster to accelerate dynamism and communication. This conjuncture served as a stepping stone to another ambitious project: bring Hacking Health to Bordeaux and organize a hackathon in the fall of 2016 to gather the digital health community ecosystem in their home city, recruit developers and help new project ideas come to reality. AquitHealth is faithful to its homeland Aquitaine in the southwestern corner of France, and aims at bringing medical experience in health innovation to create innovative tools adapted to the needs of the field. “Our motivation is to contribute to public health prevention and combine our passions for medicine and IT. Join us at the 2016 Bordeaux Hackathon!